Ontario Premier Doug Ford attends Question Period at the Ontario Legislature in Toronto, Sept. 13, 2018. Three political architects of the notwithstanding clause in the Charter of Rights and Freedoms are condemning the Ontario government’s use of the constitutional provision as Premier Doug Ford moves ahead with plans to cut Toronto council in a rare weekend sitting of the legislature. 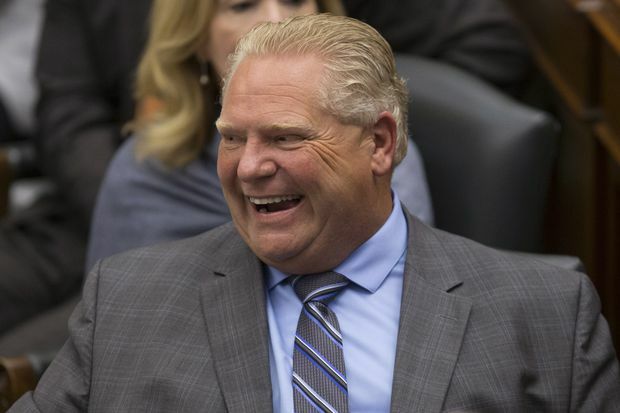 Mr. Ford is convening a rare weekend session to try to push through his plan to override the charter and cut the size of Toronto’s city council, as confusion continues to cloud the fall municipal election. The Ontario Legislature traditionally only sits on a weekend to pass urgent legislation, such as a back-to-work order for striking teachers or transit workers. But this overtime session at Queen’s Park, to get under way at 1 p.m. Saturday, comes after Toronto’s city clerk warned that the chaos around the city’s Oct. 22 election has her at a “tipping point” over whether she can properly administer the vote. It’s unclear how long it will take for the government to move ahead. Opposition NDP Leader Andrea Horwath has vowed to use procedural moves to try to slow the passage of Mr. Ford’s bill. Ms. Horwath and many of her MPPs staged a loud protest in the legislature on Wednesday when the bill was first introduced and were escorted out. Several protesters who lined up to sit in the public gallery were also arrested and removed. Rod Phillips, Mr. Ford’s Environment Minister, addressed the issue on Friday as he announced his government’s plans to take Prime Minister Justin Trudeau’s carbon tax to court. Mr. Phillips said the changes to Toronto’s council were “critical to getting rid of the political gridlock” and even solving “traffic gridlock” in Toronto. Mayor John Tory, himself a former Ontario PC leader, and several Toronto city councillors have pushed back against Mr. Ford’s assertions that city council is dysfunctional and public transit is not being built. On Monday, an Ontario Superior Court judge ruled that Mr. Ford’s first bill to cut Toronto’s council, known as Bill 5 and passed Aug. 14 with the municipal election well under way, violated the Charter’s freedom-of-expression clause. The Premier responded hours later by announcing that he would invoke the Charter’s Section 33, the notwithstanding clause, for the first time in Ontario’s history. City council voted on Thursday to continue the legal fight against Bill 5., as well as make a long-shot request for Ottawa to intervene, something Mr. Trudeau has already declined to do. The case goes before the Ontario Court of Appeal on Tuesday, where the Ontario government is seeking a stay of its defeat by the lower court ruling, pending the result of its appeal.